Sacramento, CA – The U.S. Justice Department has requested a rehearing of a decision by the 9th Circuit Court of Appeals to revoke all tolerances of the neurotoxic pesticide chlorpyrifos within 60 days, putting the proposed federal ban back in limbo for the foreseeable future. The stalling tactic is the latest in an eleven-year struggle over the fate of a pesticide known to cause autism, ADHD and IQ loss. Health advocates in California are now renewing their call to state regulators and Governor Jerry Brown to take immediate steps to end use of Dow Chemical’s blockbuster insecticide in California where almost a million pounds are used annually. 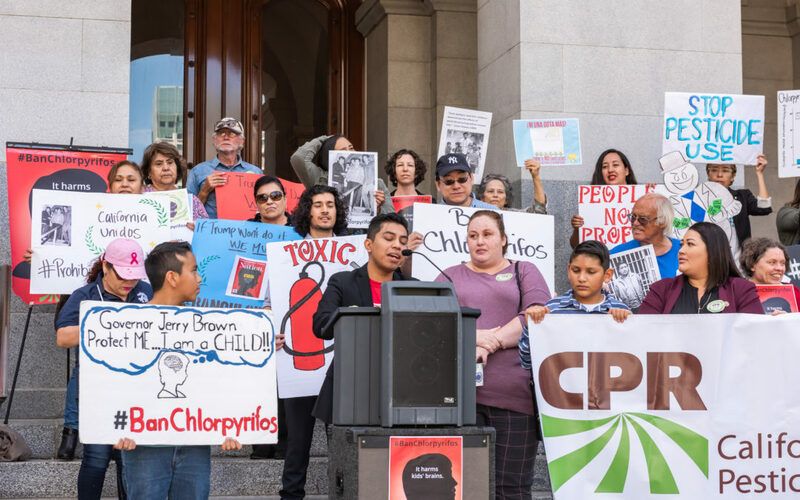 Anger at the state’s lack of progress on a chlorpyrifos ban spilled over Thursday at the State Capitol when dozens of advocates and residents of farmworking communities gathered to meet with their legislators and deliver letters to Governor Brown on behalf of nearly sixty health, labor and environmental justice organizations. The governor’s office has received close to 7,000 letters from concerned residents calling for a ban.